This is one of my habits, membuat ramalan /target time on any events that I compete in. For this upcoming 27th Panaga Triathlon, I've set a target time for each swim, bike and run. 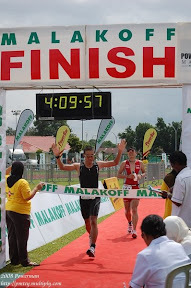 My prediction is based on my fitness level, my time during training and past triathlon results of other people and me. Most probably, my running time will be faster than predicted, maybe around 26 or 25mins. Benanang atu, mungkin tersasar sedikit (mungkin banyak jua tu) masa ramalan. Back in November 2006 which was my first triathlon and participate in the sprint event (300m swim, 14km bike and 2.5km run). I've just started 3 weeks of adult swimming lesson and here am I competing in 300m swim. Bukan aku nda pandai swimming tapi swimming ku swimming kampung. Mun kamu pernah meliat orang swimming di swimming pool, you'll know who has attend swimming lesson and those learn by themselves. My swim time for 300m was 12mins 52 seconds. Lambat hantap kali tu ahhhh......iatah namanya ni....panyu ketulahan. 300m swim, I have to do 10 laps (1 lap = 30m). First 2 laps I was ok, macam orang pro benanang, but by lap ketiga, ngalih tah ku di campur lagi dengan panic, nervous tarus breathing pun inda betantu. I managed to improve my swimming time from 12mins 52 sec to 7mins 45 sec during the 26th panaga triathlon which was held on May 2007. My overall time was 51 mins 38 sec and was rank 5th out of 15. Mun ku ikut lagi this category, maybe ada peluang menang......tapiiii sampai bila kan stay arah category short distance ani. baik tah upgrade ke longer distance. 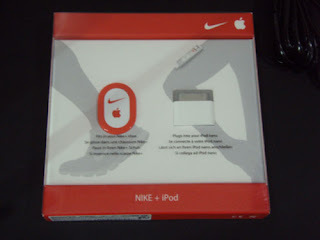 This is my Nike+ ipod Sport Kit. Masih dalam kotak. Still waiting for the right NIKE+ shoes because I just cannot simply buy NIKE+ shoes just because its brand new and fashionable. Kalau dulu dulu, boleh lah....asal baru and lawa, beli saja. Now, educated sudah sikit sikit pasal kaki and pronation. I now know that what is best for my running feet. I'm in the category of 'Flat Foot' which means I may have a tendency to overpronate. Those with 'flat foot' will notice their shoes tending to wear mostly on the inside of the forefoot area. So my shoes type is motion control shoes or stability shoes. Macam mana usulnya tu ??? usually, rubber foamnya tebal dibelakang, berat sedikit and keras. You RUN, I Walk..........I'll wait for you at the finish line !! !